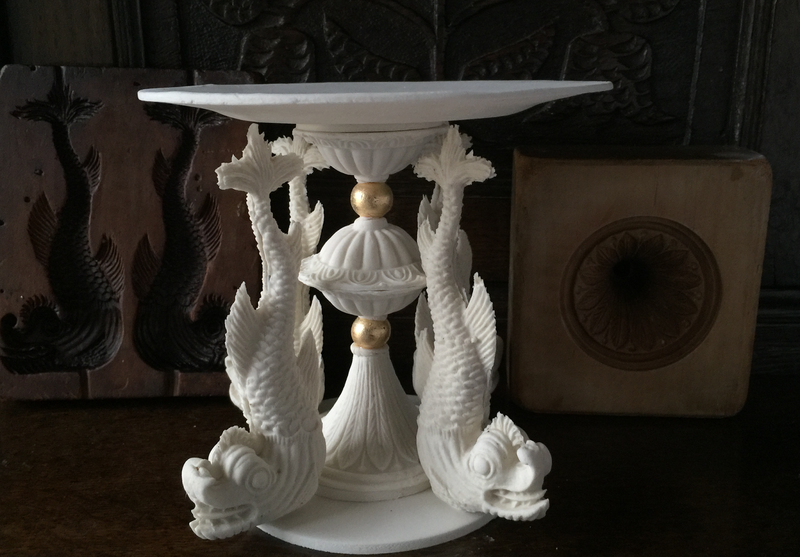 In 2015 I was commissioned by the Getty Research Institute to produce a replica of a sugar table centrepiece designed by the eighteenth century French cook and confectioner Menon. 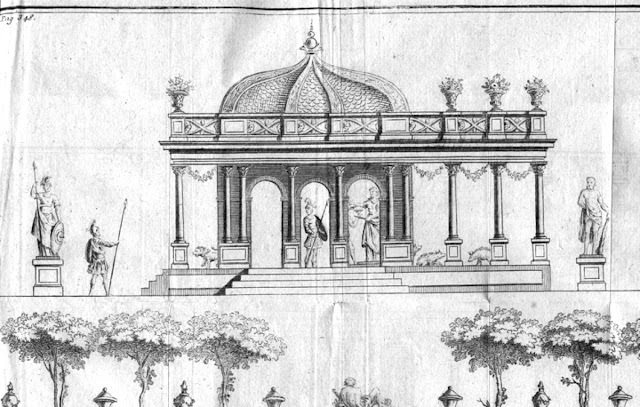 The designs first appeared in Menon's illustrated manual on confectionery La Science de Maitre d'Hotel Confiseur (Paris: 1749). My large scale pastillage version was displayed in the seminal exhibition The Edible Monument curated by my friend and colleague Marcia Reed, chief curator at the Research Institute. Marcia's stunning illustrated book The Edible Monument should be on the bookshelves of every food historian. I first displayed a version of this at Fairfax House in York in 1998 at the exhibition The Pleasures of the Table, so it has been around the houses - York, LA and now Detroit. 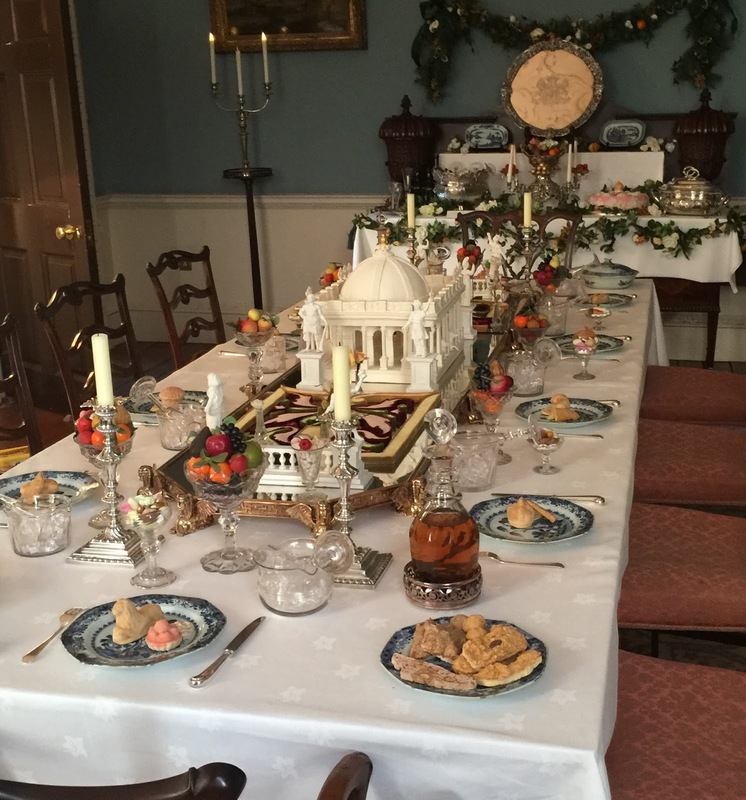 The original piece is still used for the Christmas dining room display at Fairfax House. If you were unable to get to York, or did not see the exhibition in Los Angeles, The Edible Monument is currently on show at the fabulous Detroit Institute of Arts (see details at the end of this post). But for those of you who cannot get to the DIA, here is a short video about my contribution to the show. I am in Detroit in early February and will be presenting a number of events at the Grosse Pointe War Memorial and at the DIA itself. Friday, February 3, 2017. Cuisine d’Art - GROSSE POINTE FARMS, MICHIGAN - The War Memorial invites guests to travel back in time and dine like 18th century nobility during its unique experiential event, Cuisine d’Art. Attendees will enjoy a memorable evening in The War Memorial’s lakefront ballroom, experiencing edible high-art, period drinks, and special talks by food historian Ivan Day and DIA curator Alan Phipps Darr. Plus extraordinary period-inspired food by Frank Turner, Executive Chef at the War Memorial. For full details visit the War Memorial website or ring 313.881.7511. I am afraid the this is a private event only open to to members of the DIA’s auxiliary group, the Visiting Committee for European Sculpture & Decorative Arts (VCESDA). If you are a VCESDA member here is a link for more details of the event - Ivan Day Sugar Sculpture Event. If you are not a member, you can see what I will be making below. Details of how you can become a VCESDA can be found on this page of the DIA website. 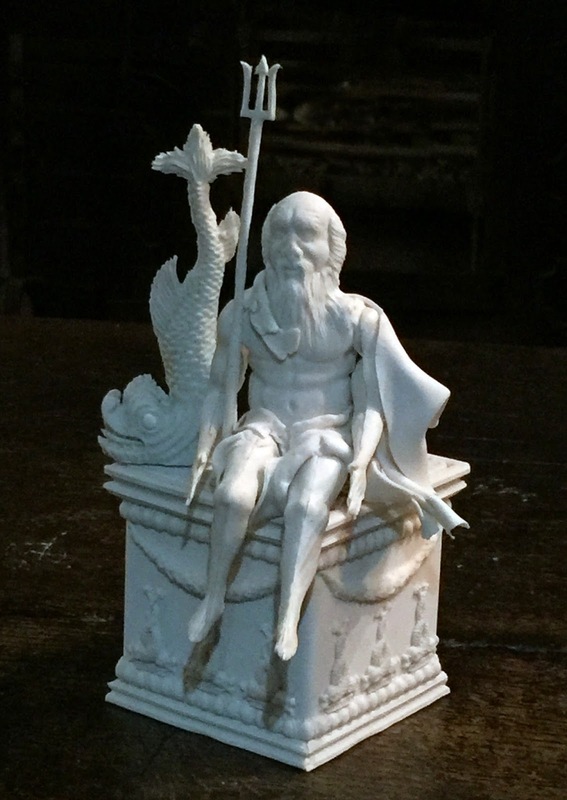 Part 1: Using a set of original 18th-century wooden moulds and equipment, I will demonstrate how to make the sugar figure of Neptune below. Part 2: Using original moulds and equipment I will demonstrate how to make the Renaissance style sugar tazza below in the style of Giulio Romano, the Renaissance painter, architect and protégé of Raphael. Saturday, February 4, 2017, 2 p.m. This is my main event. I will outline the evolution of sugar sculpture and other forms of table art from the Renaissance to the 18th century. Beginning with gilded sugar coins distributed at fifteenth century Italian wedding feasts and continuing on to papal displays of sugar trionfi, I will introduce the materials, equipment and methods used by past masters of such edible ephemera. DIA Marvin and Betty Danto Lecture Hall—5200 Woodward Avenue—Detroit, MI 48202. Sponsored by the Visiting Committee for European Sculpture & Decorative Arts. information, call 313.833.1720 or visit the DIA website. Sunday, February 5, 2017, 12-4 p.m. 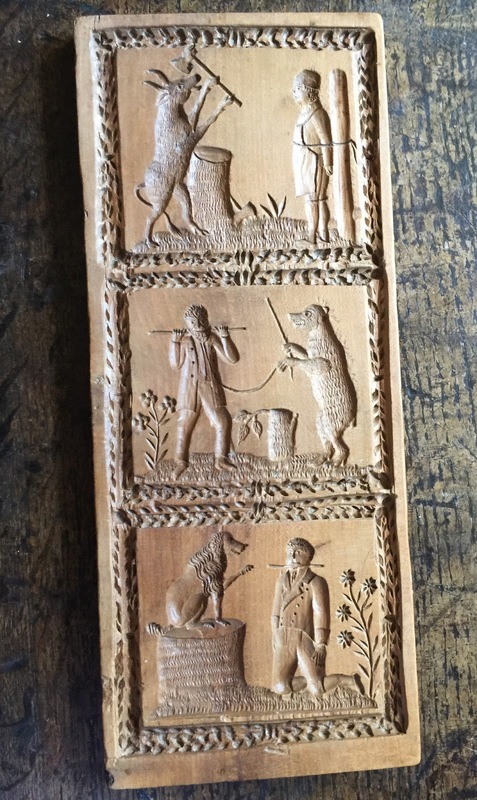 Using traditional tools and techniques to create a white gingerbread sculpture. Everyone is invited to take a close look into this unique art form and a limited number of participants will be able to create their own small sculpture to take home as supplies last. This program is in conjunction with the special exhibition The Edible Monument: The Art of Food for Festivals on display through April 16, 2017. This is a family event, free with museum admission. For further information, call 313.833.1720. 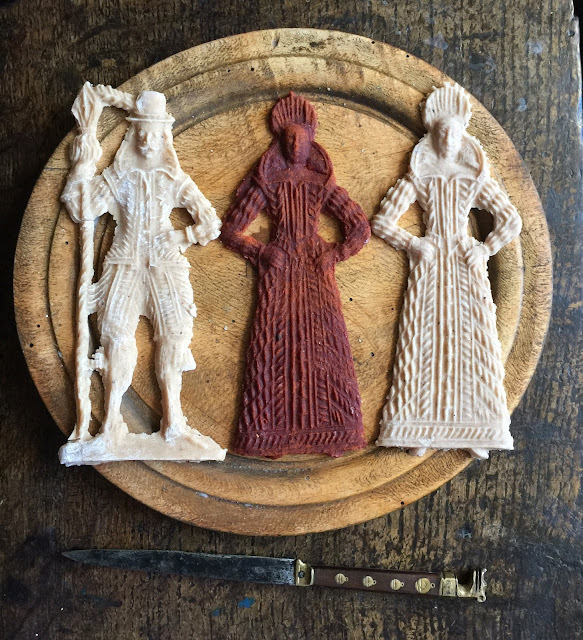 Gingerbread figures made from a seventeenth century mould. The fine lady in the middle is made from red gingerbread, the two other figures from white gingerbread. Both these early gingerbread were popular at the time of Shakespeare. 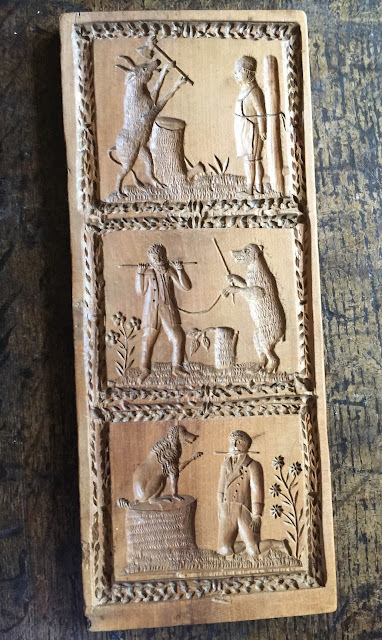 A mould to make three gingerbreads where the usual dominant role of humans over animals is reversed. Public celebrations and street parades featured large-scale edible creations made of breads, cheeses and meats. At court festivals, banquet settings and dessert buffets featured elaborate table monuments made of sugar, flowers and fruit. These edible sculptures didn’t last long, but images of towering garden sculptures and lavish table pieces designed for Italian and French courts have survived in illustrated books and prints, many of which are featured in the exhibition. The exhibition includes a monumental sugar sculpture based on an 18th-century print. “Palace of Circe” by sculptor and culinary historian Ivan Day is set on an 8-foot table and features sugar paste sculpted into a classical temple with sugar statues and sugar-sand gardens. The figures were meant to impart the consequences of gluttony with a story about the ancient Greek hero Ulysses. When he landed on the island of Aeaea, his men were so greedy that the sorceress Circe turned them into pigs. 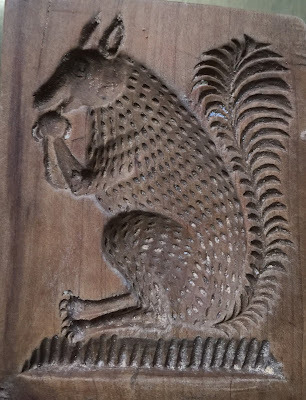 By the mid-17th century cookbooks and guides to the new skills and professions of carving and pastry-making were published. Copied and plagiarized, they became models that spread throughout European court culture. Examples of such books are included in the exhibition, such as one by Bartolomeo Scappi, the “private cook” to Pope Pius V; Joseph Gilliers, the dessert chef to King Augustus of Poland; and Juan de la Mata, court chef to the Spanish kings Philip V and Ferdinand VI. This is another wonderful exhibition at the DIA. From social revolutions that changed the way we drink our morning blends, to design revolutions that changed the objects that we drink from, step back in time to when gathering over a cup of your favorite hot beverage caused a stir that upended the world. Bitter/Sweet: Coffee, Tea & Chocolate is the first exhibition at the Detroit Institute of Arts to engage all five senses. In addition to seeing art, you can touch, hear, smell and even taste coffee- and tea-related beverages. The Edible Monument Lecture by Alan Darr February 7, 2017 at 7 p.m.
Another unmissable event is a lecture entitled The Edible Monument by Dr. Alan Phipps Darr, Senior Curator of the European Art Department at the Detroit Institute of Arts. The lecture is free, open to the public, and is sponsored by the Friends of the Grosse Pointe Public Library. It will be held on February 7, 2017 at 7 p.m. at the Grosse Pointe Public Library Ewald Branch, 15175 E Jefferson, Grosse Pointe Park, MI 48230. Exquisite work and the moulds too. Very exciting. Must be going to the Getty Museum in LA next. Just breathtaking !-wish I lived near enough to see it in person - and the gingerbread molds are so charming! My holiday gingerbread men look quite sad after seeing this.